Referring to the role played by our establishment press as stenography is truly an insult to the work of professional stenographers. 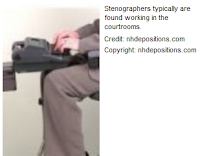 I worked for years with highly professional stenographers in hundreds of depositions and court proceedings. Their defining trait is that they have a fierce devotion to transcribing accurately everything that is said and doing nothing else. It's not uncommon for lawyers, in the heat of some dispute, to attempt to recruit the stenographer into the controversy in order to say who is right. Stenographers will never do that. They will emphasize that they are only there to write down what is said, not to resolve disputes or say what actually happened -- exactly like Time Magazine and most of our press corps. If someone in a court proceeding voices even the most blatantly false accusations, stenographers will faithfully write it down and publish it without comment -- exactly like Time Magazine and most of our press corps, at least when it comes to claims from the government and its GOP operatives. But there's a fundamental difference: stenographers are far better at their job, since they give equal weight to what all parties say. But Time and friends exist principally to trumpet government claims and minimize and belittle anything to the contrary, and they pretend to "balance" it all only when they're caught mindlessly transcribing these one-sided claims and are forced to write down what the other side says, too. The bulk of our establishment journalists aren't merely stenographers. They're bad stenographers. [W]e have found a number of instances of coverage [of pre-Iraq war claims] that was not as rigorous as it should have been. In some cases, information that was controversial then, and seems questionable now, was insufficiently qualified or allowed to stand unchallenged. Looking back, we wish we had been more aggressive in re-examining the claims as new evidence emerged -- or failed to emerge. . . . Complicating matters for journalists, the accounts of these exiles were often eagerly confirmed by United States officials convinced of the need to intervene in Iraq. Administration officials now acknowledge that they sometimes fell for misinformation from these exile sources. So did many news organizations -- in particular, this one. . . .
"The paper was not front-paging stuff," said Pentagon correspondent Thomas Ricks. "Administration assertions were on the front page. Things that challenged the administration were on A18 on Sunday or A24 on Monday. There was an attitude among editors: Look, we're going to war, why do we even worry about all this contrary stuff?". . . .
Across the country, "the voices raising questions about the war were lonely ones," [Post Executive Editor Leonard] Downie said. "We didn't pay enough attention to the minority" . . . .
From August 2002 through the March 19, 2003, launch of the war, The Post ran more than 140 front-page stories that focused heavily on administration rhetoric against Iraq. Some examples: "Cheney Says Iraqi Strike Is Justified"; "War Cabinet Argues for Iraq Attack"; "Bush Tells United Nations It Must Stand Up to Hussein or U.S. Will"; "Bush Cites Urgent Iraqi Threat"; "Bush Tells Troops: Prepare for War" . . . . In October 2002, Ricks, a former national security editor for the Wall Street Journal who has been covering such issues for 15 years, turned in a piece that he titled "Doubts." It said that senior Pentagon officials were resigned to an invasion but were reluctant and worried that the risks were being underestimated. Most of those quoted by name in the Ricks article were retired military officials or outside experts. The story was killed by Matthew Vita, then the national security editor and now a deputy assistant managing editor. . . .
Bush, Vice President Cheney and other administration officials had no problem commanding prime real estate in the paper, even when their warnings were repetitive. "We are inevitably the mouthpiece for whatever administration is in power," [Post Editor Karen] DeYoung said. "If the president stands up and says something, we report what the president said." And if contrary arguments are put "in the eighth paragraph, where they're not on the front page, a lot of people don't read that far." AS domestic support for the war in Iraq continues to melt away, President Bush and the United States military in Baghdad are increasingly pointing to a single villain on the battlefield: Al Qaeda. . . . But these are stories you haven't been reading in The Times in recent weeks as the newspaper has slipped into a routine of quoting the president and the military uncritically about Al Qaeda's role in Iraq -- and sometimes citing the group itself without attribution. And in using the language of the administration, the newspaper has also failed at times to distinguish between Al Qaeda, the group that attacked the United States on Sept. 11, and Al Qaeda in Mesopotamia, an Iraqi group that didn't even exist until after the American invasion. COVERAGE of the American saber-rattling about Iranian intervention in Iraq posed an important test for The New York Times, given the paper's discredited pre-war articles about Saddam Hussein's weapons of mass destruction. And it has triggered a rash of complaints from readers who believed The Times was again serving as a megaphone for the White House. . . . Failing to reach out for dissenting views was a pre-war shortcoming, The Times has previously acknowledged. So even after [NYT reporter Michael] Gordon had "nailed" key parts of the Feb. 10 article [regarding Iran's alleged involvement in Iraq], according to Mr. Keller, editors specifically asked him "to talk to places in government that had been skeptical of W.M.D.," such as the State Department. Still, editors didn't make sure all conflicting views were always clearly reported. For example, the article on Mr. Bush's news conference pointed out that the position of the president -- and the similar position taken earlier in the week by the chairman of the Joint Chiefs of Staff -- differed from the suggestion at the Sunday Baghdad briefing that the weapons effort involved top levels of the Iranian government. That story also should have noted, however, that the president's view on this point differed from the intelligence assessment given readers of the Feb. 10 article. WALTER ISAACSON: There was a patriotic fervor and the Administration used it so that if you challenged anything you were made to feel that there was something wrong with that. . . .
WALTER ISAACSON: Especially right after 9/11. Especially when the war in Afghanistan is going on. There was a real sense that you don't get that critical of a government that's leading us in war time. . . .
BILL MOYERS: When American forces went after the terrorist bases in Afghanistan, network and cable news reported the civilian casualties. The Patriot Police came knocking. BILL MOYERS: So Isaacson sent his staff a memo, leaked to The Washington Post: "It seems perverse," he said, "to focus too much on the casualities or hardship in Afghanistan." PHIL DONOHUE: Yes. I was counted as two liberals. . . . I had to have two . . . . there's just a terrible fear. And I think that's the right word. I suppose you watch enough television to know that the big TV show is over and that the war is now over essentially -- the major combat operations are over anyway, according to the Pentagon and defense officials -- but there is so much that is left behind. And I'm not just talking about the most important thing, which is, of course, the leadership of a Middle Eastern country that could possibly become an enormous foothold for American and foreign interests. But also what Americans find themselves deciding upon when it comes to news, and when it comes to coverage, and when it comes to war, and when it comes to what's appropriate and what's not appropriate any longer. . . .
That said, what didn't you see? You didn't see where those bullets landed. You didn't see what happened when the mortar landed. A puff of smoke is not what a mortar looks like when it explodes, believe me. There are horrors that were completely left out of this war. So was this journalism or was this coverage? There is a grand difference between journalism and coverage, and getting access does not mean you're getting the story, it just means you're getting one more arm or leg of the story. And that's what we got, and it was a glorious, wonderful picture that had a lot of people watching and a lot of advertisers excited about cable news. But it wasn't journalism, because I'm not so sure that we in America are hesitant to do this again, to fight another war, because it looked like a glorious and courageous and so successful terrific endeavor, and we got rid oaf horrible leader: We got rid of a dictator, we got rid of a monster, but we didn't see what it took to do that. . . .
As a journalist I'm often ostracized just for saying these messages, just for going on television and saying, "Here's what the leaders of Hezbullah are telling me and here's what the Lebanese are telling me and here's what the Syrians have said about Hezbullah. Here's what they have to say about the Golan Heights." Like it or lump it, don't shoot the messenger, but invariably the messenger gets shot. . . .
War is ugly and it's dangerous, and in this world the way we are discussed on the Arab street, it feeds and fuels their hatred and their desire to kill themselves to take out Americans. It's a dangerous thing to propagate. . . .
As Eric Alterman documented before most people were pointing it out, the greatest myth in our political culture is the Rush-Limbaugh-generated complaint about the "liberal media." Other than right-wing fanatics like Limbaugh and his followers (including those in the press), who can review this deliberately one-sided, government-worshipping record -- and it is but a tiny fraction, much of it from the "journalists" like Klein assigned to play the "liberal" role -- and maintain that "liberal media" myth with a straight face? The issue of "why" the media behaves this way is complex and completely separate from demonstrating that they do. There are numerous factors. Some of it is ideological. Much of it is the perception of what is economically rewarding (as Banfield suggested, along with Billmon when analyzing Time's descent into right-wing pablum). A huge amount of it is due to the herd behavior of our vapid, eager-to-be-liked journalist class, desperate for access to and affection from power -- which, in Washington, means GOP operatives and high government officials. And there are other factors as well, some socioeconomic and some relating to the natural political goals of corporate executives. But what all of these incidents conclusively demonstrate -- including the latest Time/Klein scandal -- is not merely that our establishment media act as stenographers. If they did, that would be an upgrade. They act as eager, obedient stenographers for one side -- the Government and the GOP power structure inside Washington -- faithfully promoting their views as fact until forced to do otherwise. What other conclusion can be reached from this ample, disgraceful record, perfectly illustrated by Time's extremely commonplace conduct? UPDATE: Just for the sake of accuracy, I want to underscore that the critiques here are generally applicable to the behavior of the establishment media, not to every individual who works within it. There are good, even exceptional, individual journalists who work at almost every one of these media outlets and who understand and perform adversarial journalism very well. But they are the rare exception. We are retreating to a fine old American press cop-out we like to call objectivity. Russell Baker once described it: "In the classic example, a refugee from Nazi Germany who appears on television saying monstrous things are happening in his homeland must be followed by a Nazi spokesman saying Adolf Hitler is the greatest boon to humanity since pasteurized milk. Real objectivity would require not only hard work by news people to determine which report was accurate, but also a willingness to put up with the abuse certain to follow publication of an objectively formed judgement. To escape the hardwork or the abuse, if one man says Hitler is an ogre, we instantly give you another to say Hitler is a prince. A man says the rockets won't work? We give you another who says they will. . . . The American press has always had a tendency to assume that the truth must lie exactly halfway between any two opposing points of view. . . .This tendency has been aggravated in recent years by a noticeable trend to substitute people who speak from a right-wing ideological perspective for those who know something about a given subject. . . . The odd thing about these television discussions designed to "get all sides of the issue" is that they do not feature a spectrum of people with different views on reality: Rather, they frequently give us a face-off between those who see reality and those who have missed it entirely. In the name of objectivity, we are getting fantasyland. Or, as Time puts it: "Republicans believe the bill can be interpreted that way, but Democrats don't." Now to the news media. . . the Mainstream Media. . . as it has become known, and an object lesson in how the blogosphere is changing the way the MSM operates. . . . Believe me, I'm not pointing this out because it involves competitors. Browse around the archives of DailyHowler.com or MediaMatters.org if you want to see harsh criticism of us. The point is, journalists, particularly in Washington, aren't going to be able to repeat partisan spin that contains falsehoods as analysis without being called on it anymore. And as Greenwald notes, it's rather telling that the calling-out is coming from the blogosphere and not the actual Democrats who Klein misrepresented. Maybe that's why there is a blogosphere to begin with. That's interesting for many reasons. Does anyone know what Colvin means when he refers to the "particularly nasty resonance in our newsroom" from ABC's false Saddam-anthrax story? (update: several commenters and e-mailers point out that it almost certainly refers to the receipt by NBC's newsroom of an anthrax envelope addressed to Tom Brokaw). How that false ABC anthrax story came to be is still one of the most important, unresolved political mysteries of the Bush presidency. ABC could, of course, easily resolve it by disclosing what they know, but that would require them to act as actual journalists. UPDATE III: The Chicago Tribune today published large excerpts from Klein's column, including the factually false parts. Thus: the House Democrats' bill would "would require the surveillance of every foreign-terrorist target's calls to be approved by the FISA court" and "would give terrorists the same legal protections as Americans," which is "well beyond stupid." And: "Speaker Nancy Pelosi quashed the House Intelligence Committee's bipartisan effort and supported [this] Democratic bill" instead. WALTER PINCUS: More and more, in the media, become, I think, common carriers of Administration statements, and critics of the Administration. And we've sort of given up being independent on our own. . . .
We used to do at the Post something called truth squading. President would make a speech. We used to do it with Ronald Reagan the first five or six months because he would make so many factual errors, particularly in his press conference. And after two or three weeks of it, the public at large, would say, "Why don't you leave the man alone? He's trying to be honest. He makes mistakes. So what?" and we stopped doing it. It's amazing how virtually every media criticism voiced outside of Rush Limbaugh Land applies so completely and perfectly to what Time and Joe Klein did here. As Media Bloodhound notes, Tom Brokaw sat with Howard Kurtz just this weekend and gave what has become the media's standard stenographer excuse: namely, they failed to scrutinize Bush pre-war claims about Iraq because "the opposition voices were not that many in this town." Thus, they only write down what people say, and if only few people are saying the truth, it's not their job to find it out (that was the same excuse Tim Russert gave to Bill Moyers as to why the media did little other than regurgiatate Bush claims: "It's important that you have an opposition party"). On a different though equally important note, Markos Moulitsas examines the role which the Democrats' passivity plays in enabling all of this.